Jeredith Merrin’s third collection, Cup, deftly muses on art, travel to exotic locations, nature’s gains and losses, the resiliency of spirit juxtaposed against the body’s frailty, the joys and discords of the familial unit, and aging without bitterness and giving “Praise/ to her or him who keeps, past sixty/ and in all weathers, an open heart.” This collection of abundant wit, insight, longing and passion is deservedly a special honoree of the 2013 Able Muse Book Award. In Cup we meet a poet of rare power and unique originality, unafraid of feeling, able to take on matters of the deepest consequence. Jeredith Merrin strikes me as admirably hard-minded, shunning poeticisms and needless wordage, delivering again and again the real thing. For proof, see the title poem, or the wonderful tribute to John Clare. Plunge in anywhere, and be regaled. In these forthright and moving poems written in restrained, disciplined stanzas, the stories are told of how we each, “trying to make it better,/ whatever . . . it is,” have to find our own cup, and find it acceptable. This is most vividly so in the poems about the bravery and laughter required by a terrible sickness, but also in the very description of a block of still-inhabited Victorian houses, porch after porch, which is like a train going who knows where. The poems’ stanzas are the rooms, and in the rooms are the lives. 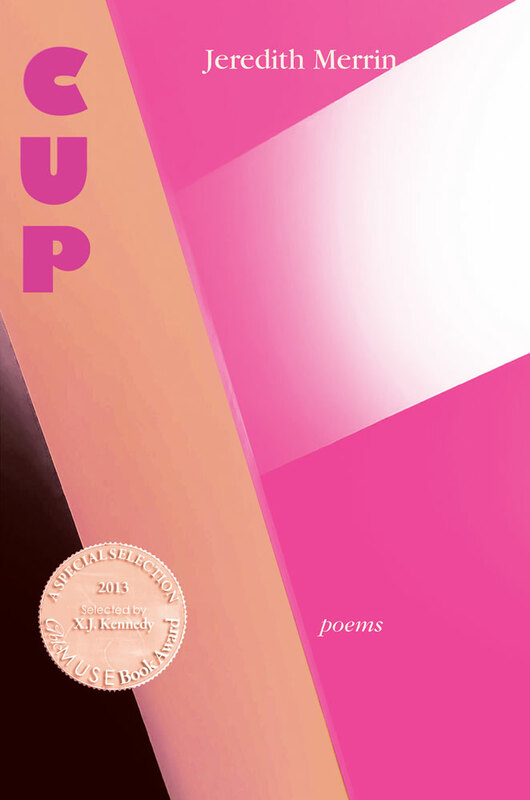 In Cup, Jeredith Merrin confronts time’s confounding passage, but there’s not a glimmer of self-pity here, no mourning the fate of an aging body. Instead she offers us an artful contemplation of what age brings: the strangeness of shifting perspectives, the quiet richness of sustained love, and the unabated force of old griefs. Both witty and meditative, these poems brim with insight and affection. And “Lear’s Macaw” alone is worth the price of admission! 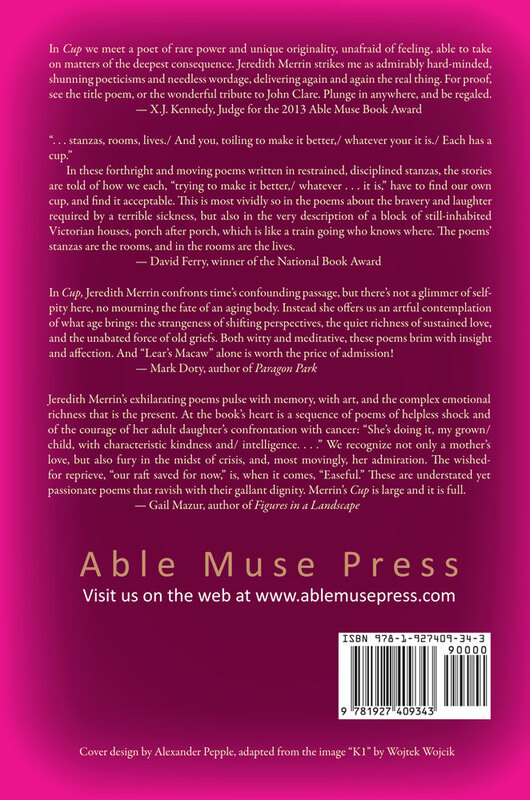 Jeredith Merrin’s exhilarating poems pulse with memory, with art, and the complex emotional richness that is the present. At the book’s heart is a sequence of poems of helpless shock and of the courage of her adult daughter’s confrontation with cancer: “She’s doing it, my grown/ child, with characteristic kindness and/ intelligence. . . .” We recognize not only a mother’s love, but also fury in the midst of crisis, and, most movingly, her admiration. The wished-for reprieve, “our raft saved for now,” is, when it comes, “Easeful.” These are understated yet passionate poems that ravish with their gallant dignity. Merrin’s Cup is large and it is full.